Pick your own crisp, juicy apples at one of these Rhode Island orchards. There’s no better fall tradition than spending a few hours out on the farm with friends and family, and ending the day with some hot apple cider or cider donuts. Support your local farm this fall and go pick some apples! Doland Dame, of Dame Farms, purchased this farm in 1890 and has been making a living off of the apple orchards ever since. You can pick your own everything, from pumpkins to blueberries, but be sure to pick their fresh apples starting in September! Even when certain orchards don’t experience a good year, it seems like Pippin always comes out on top! In addition to apple picking, try their delicious apple pie, or pick up some beautiful mums for the fall season! Elwood is best known for its delicious organic gourmet garlic and pick-your-own nectarines and peaches. Many don’t realize that they have plenty of apple trees on their property as well, such as the Sansa (a gala cross) or the Redfree, which is a small lunchbox apple. 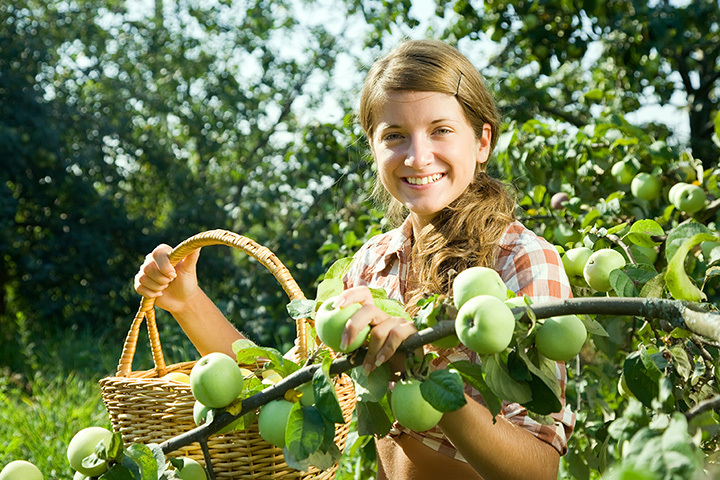 Enjoy picking your own apples every day of the week! Stop by Steere’s storefront to check where you’re allowed to pick that day, and then head out to the orchards! On the weekends, you can enjoy their free hayrides, too! For five generations, this little farm has been owned and operated by the Phillips family. When you stop by to pick some apples, the Phillips will make sure that you’re in good hands! Try their delicious Fuji, Gala, or Honeycrisp apples, which are well worth a visit out. Starting in early September, you can head out to Jaswell’s to pick your own apples! The season is sure to last late into October, but if you can’t make it out in time, you can still enjoy fresh-picked apples all the way through December from Jaswell’s! This idyllic apple orchard and farm stand is a community staple of Cumberland! Families have spent years picking apples there, and you can be the next generation to bring your family around! Come for the pick-your-own apples, but stay for the fantastic horse-drawn hayrides! Kids will love chomping down on their freshly picked pieces of fruit while taking a tour around the orchards. At this orchard, you’ll have plenty of room for apple-picking. On Saturdays and Sundays in the fall, head out to the Barden Family Orchard to pick a variety of apples during the daytime. School and day care groups can book an appointment with them, too! Besides their apple cider donuts, there’s perhaps nothing more famous at Appleland Orchards than their freshly picked apples! Their orchards are home to a huge variety of apples, such as the classic red delicious and gala in addition to more unique flavors such as the Mutsu, Rome, and Ginger Gold. View more Rhode IslandApple Orchards.